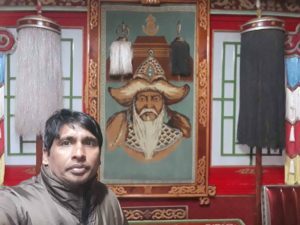 This is the story of my last Mongolia visit from 09-17 November 2017. As I landed Mongolia on November 10, 2017 it was minus 9 degree Celsius. November 14, 2017 was my fifth day of the tour. I got a chance to visit Tumen Ekh. Tumen ekh is one the best national song and dance ensemble in Mongolia. It founded in 1989. A group of outstanding artist took the name of famous folk song “Tumen Ekh”. 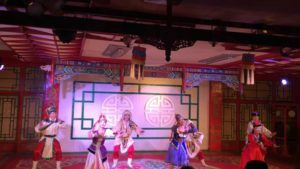 The ensemble’s goal is to present a rare selection of ancient Mongolian performing arts and culture to local and international audiences, particularly younger generations. 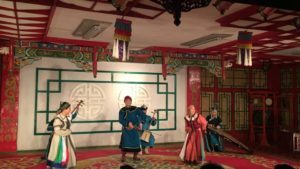 The ensemble comprises artists who perform all types of Mongolian song, music and dance. 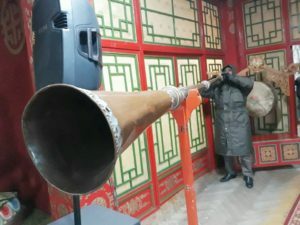 They play traditional instruments including the morin khuur (horse head fiddle) and perform Mongolian long song, epic and eulogy songs, a ritualistic shaman ritual dance, an ancient palace dance and a Tsam mask dance. Their performances are highly professional but retain the authenticity and traditions of nomadic culture. T he music of Mongolia expresses vastness, freedom and life in harmony with nature and the environment. The Tumen Ekh ensemble is one of the most successful folk art groups to share traditional Mongolian music. They have traveled over 40 countries to introduce the unique, vibrant and astonishing art of Mongolia. They have successfully performed at the World Music Center in New York, the Kennedy Center in Washington D.C. Also in Buckingham Palace in the UK among others. But Tumen Ekh is more than just a group of performers on a stage. 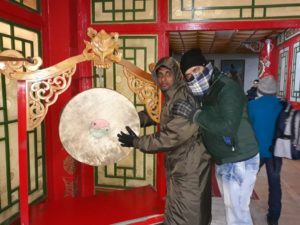 Members of the ensemble participate in cultural exchanges, conduct research and studies on folklore and engage in training and creative activities. The Tumen Ekh ensemble will take you on a brief tour to Mongolia’s world of folk art, where vast steppes of grassland, clear blue skies, and a nomadic way of life has been developed and preserved for thousands of years. Tumen Ekh means ‘leader of ten thousand’. Tumen Ekh is the title bestowed upon the fastest race horse in Mongolia, a symbol of power and speed.